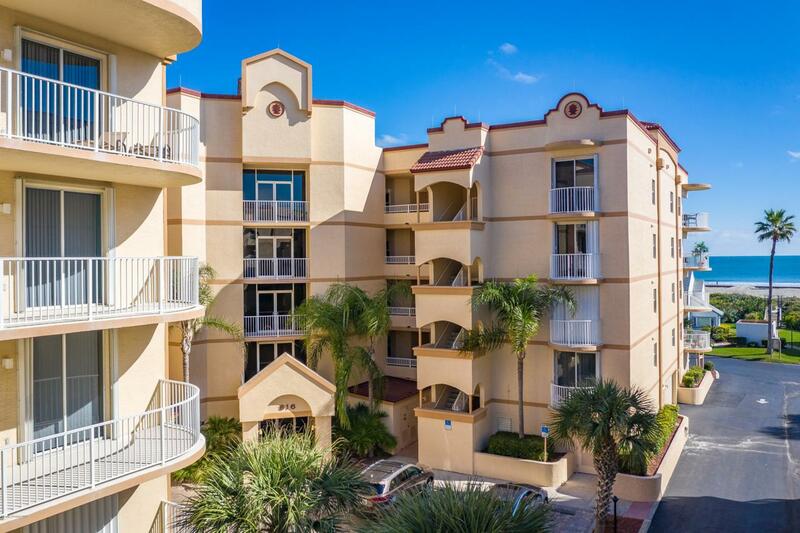 Florida lifestyle resort style living at Seaport Oceanfront Condos close to Port Canaveral, cruise ships, Jetty Park, Orlando Int'l Airport, Kennedy Space Center, and Disney. The most north eastern building steps from the beach. Secure lobby, gated community entrance, 4 pools (kidney pool with hot tub for this community only), numerous beach access walkways, lighted tennis courts, racquetball courts. Brand new refrigerator and dishwasher. New carpet in 2018. Kitchen granite counter tops. Spacious laundry room. One-car private garage. Sliders from master bedroom and living room lead to balcony offering a partial view of the ocean. Front bedroom with a peek of the ocean. A short ride to Jetty Park and Cocoa Beach Pier. Community close proximity to watching spectacular rocket launches.